Coral serve over 130 different countries globally and have built themselves a great reputation. Percentage wise, their welcome bonus is the biggest around with only a £5 bet needed to release £20. Bet £5 get £20 free bets. » Cash out & partial cash out. » Slightly clumsy mobile app. » Limited live streaming (2,000 events). The welcome bonus offered by Coral provides new customers with £20 worth of free bets, credited in the form of four separate £5 free bets, which the customer will receive if their first sports bet with Coral is worth at least £5 and is at odds of 1/2 or greater. That qualifying bet must also be placed within 14 days of the new account being registered and the free bets will be triggered once it has been placed. Once credited, the free bets must be used within seven days or else they will expire and the free bet stakes are not returned with any winnings from their wagering. For a full and detailed breakdown of the new player offer visit our Coral free bet page. ‘Super Acca Insurance’ – Coral’s enhanced version of football acca insurance offers customers a refund of their stake as a free bet up to a maximum of £25, if one leg lets down a 6-8 fold bet, up to two legs let down a 9 or 10 fold bet or up to three legs let down an 11+ fold bet. The insurance is available for football accumulators in the ‘match result’ market. T&C’s apply. ‘Coral Acca Club’ – Essentially a different new customer offer, a customer whose first bet with Coral is a four or more fold football accumulator at odds of 1/2 or greater and up to a maximum of £20, can get five free bets of an equivalent value through the ‘Coral Acca Club’. Those free bets are credited one per week for five weeks after the qualifying bet is placed and must all be placed on four fold or more football accumulators. T&C’s apply. Basketball Acca Insurance – Place a four match spread bet accumulator on NBA or Euro League basketball and you get your stake back as a free bet up to a maximum of £25 if it fails by just one leg. T&C’s apply. Best Odds Guaranteed – For all UK and Irish greyhound and horse races, Coral customers will have their bets paid out at the starting price if it is longer than the price they took when placing their bet. T&C’s apply. To see all offer running go to Coral bookmakers and click ‘Promotions’. Bet In Play – The Bet In Play section of the Coral website provides in-play markets for a great array of events across a whole host of different sports. When customers click into an event, they will also find excellent live scoreboards and handy other visuals along with the many markets provided. Coral Live Stream – There are close to 2,000 events streamed live through the Coral site on a weekly basis, with football, tennis and racing featured most highly. The sports streams can be watch by any customer with a funded account, whilst anyone who has bet at least £1 on a greyhound or horse race is eligible to watch that race. The streaming service is also available for users of iPhones, iPads and Android devices. Cash Out and Partial Cash Out – Available for selected football, tennis, darts and snooker matches, Coral’s cash out and partial cash out feature puts customers fully in control. They can choose the normal cash out option to take their money and run at any point of a bet or can hedge their bets and select a percentage of their wager to partially cash out. Online sports bookmakers are increasingly realising that punters can’t always get to their computers and as such are increasingly providing mobile apps to allow for betting on the move. Coral are no different, and their mobile app is made widely accessible to users of all types of mobile device. There is a downloadable version of the Coral app available to both iOS and Android device users, and they – along with users of other devices – can also choose to use the mobile web app available via browser which provides an almost identical service. The app itself, however it is accessed, is also one of the very best around with great navigability twinned with an intuitive bet slip and a huge range of both pre-event and in-play markets. The in-play interface on the mobile app is also really impressive and is the portal to access mobile live streaming which is a feature that sets the Coral app apart from many competitors. The fact that all the same features from the desktop site are incorporated into and available on the app impacts positively on the final overall rating of our Coral Review (over rating available below). Coral – or Eurobet as they are known in a number of countries – are a globally popular and successful online bookmaker serving customers in more than 130 countries in total and recording huge turnovers and profits on an annual basis. As such, it can easily be claimed that Coral are one of the biggest online bookmakers around and that in itself suggests that the service provided is a pretty impressive one. Add to that the fact that Coral do have an excellent reputation for reliability and integrity, and you find that the provider is an extremely popular one with its many customers. In an age of growing anxiety about cyber security, Coral can also boast top level security mechanisms for protecting financial and personal data. These include the use of certified SSL technology to provide top level encryption of all sensitive information and the employment of firewalls and other security measures to further guard any stored data. In terms of protecting players from themselves too, Coral also provide a number of features aimed at promoting and ensuring responsible gambling. The most notable of these are the ability to set deposit limits for your account, to request a ‘time out’ period if a spell away from gambling is require or to request a permanent closure of your account. If anything does go wrong with their account or if they have any kind of betting query, there are a number of ways in which Coral customers can seek support. These methods are via a live chat option available through the website, by calling a dedicated telephone helpline or by emailing the company with the issue or question. The live chat option is available instantly and the company strive to provide a response via email as quickly as possible. Betting with Coral is certainly a good choice for any online gambling fan, from the most casual to the most dedicated punter. 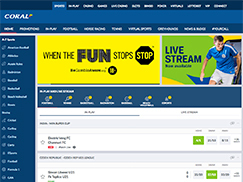 The service provided by Coral is unquestionably one of the best around, with a huge range of both pre-event and in-play markets available and really user-friendly and easily navigable features included in both their desktop site and their mobile app. Added extras like an impressive live streaming service and an interesting and useful ‘cash out and partial cash out’ function further enhance the customer experience, as does the decent selection of promotions and bonuses provided to new and existing customers. All in all, the online bookmaking service that Coral provides to its customers is one of the very best around and is hard to beat. We’re yet to review a bookmaker that’s perfect and our Coral review is no different. Here’s what could be improved. Coral as an online bookmaker are so generally impressive that there are few real areas of improvement to pinpoint. If you were going to split hairs however, you could find slight fault with the appearance of their mobile app and the diversity of their promotions. Especially their joining bonus when you compare it to the Bet365 deposit bonus available for new customers. Their app after all, is not one of the glitziest around and so is not as easy on the eye as some, and their promotions are very accumulator focused. Those are extremely small issues however, which would likely not even register with the vast majority of customers and if you’re into accumulator betting like we are then you’ll likely love them. Comments or questions about our Coral bookmakers review? Send them our way via the contact page.